This interview was conducted via email by Interview Editor Audrey Hawkes. Of the process she said, “Celeste’s novel is poignant and really hit home for me. Her thoughtful responses to my questions give such insight into her process, and for that I feel extremely lucky.” In this interview, Celeste talks about how motherhood changed her perception while writing, the importance of character, and why she loves Twitter. Superstition Review: You worked on Everything I Never Told You for six years before it was published. Could you describe the experience of living with the project? How did you know it was where you wanted it to be? 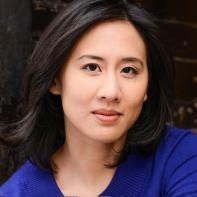 Celeste Ng: About 4 years in I started comparing the project to a grown child who refused to move out of my basement. That sums up my feelings pretty well. I just wanted to be done with it—but I also knew the book wasn’t ready, that I hadn’t gotten it to where it needed to be in order for it to go out into the world. Between the third and fourth drafts, I spent a lot of time thinking about craft and structure issues, and when I started writing again, I could feel the pieces clicking together. It came easily, which is something I never would have said about the earlier drafts. I always think of writing as articulating your own thoughts to yourself. There’s a moment when what’s on the page and what’s in your brain finally align, and that’s when you know it’s done. SR: How did writing this book prepare you for your future writing projects? Do you feel like your approach has changed for what you’re working on now? CN: I tried so many things with this novel—writing any first book, published or not, is kind of a crash course in How to Write a Book. In the first drafts, I tried writing blindly, with no plan, just seeing where the story took me; I reverse-outlined what I’d written to see what story I was actually telling and where I could cut or rearrange pieces to tell it better. I researched revision, structure, and point of view by looking at books I admired and trying to figure out how they worked. So I have a lot of different tools to try with the next book. I do find that I’m approaching this second novel differently than I approached the first. For one thing, I thought about it a lot more before I ever set any of it down on paper. This was an idea that had started nagging me as I finished the first book, and while I was on tour, I couldn’t write, but I found I could think. I could flesh out the characters in my mind and find out what drove them. I could spin some of the plot in my head, go down dead-ends, backtrack and come up with a more interesting scene. Essentially, what I’d done on paper in the first drafts of Everything I Never Told You, I was doing mentally while traveling. So when I sat down to start writing this second book, I already had a good idea of what story I was telling and where I thought the book was going to go. There have still been plenty of detours that surprised me, and plenty of false starts. And I don’t know that the writing itself is going faster. But I feel like I have a very vague idea of what I’m doing now—it’s like the second time you drive a car as opposed to the very first, maybe. You’re still not very good at it, but at least you know which one is the gas and which one is the brake. SR: Everything I Never Told You has received a lot of well-deserved praise. Has that influenced the direction you plan to take in other writing projects, and do you feel any extra pressure because of it? CN: Honestly, it’s been a huge motivation and encouragement for me. While writing the first book, I worried that no one would ever want to read it. Now I’m fairly sure someone will read this second book, and that takes away some of the uncertainty. Of course, a different anxiety rushes right back in to fill that space: second books are hard because inevitably, they’ll be compared to the debut. And this second book will be different from the first: the main characters aren’t Asian American; the setting and plot are different; the tone is different. They do share similarities in themes: relationships between mothers and daughters; the pressures of race; issues of class and gender and outsider-ness. Will readers who loved the first book love the second? I hope so, but I don’t know. I can’t control that—I just have to try and write the best book I can, and then it’s up to the reader. SR: The Times UK refers to the novel’s progression as “the gradual peeling back of the layers.” The level of intimacy we get with the characters is one of the most powerful parts of the narrative — I’ve always loved stories that are driven by strong characters. Do you find yourself drawn to stories that build that kind of intimacy? Can you share some of your literary influences? CN: I think of character as the root of story—for me, plot always begins in character, and I write because I’m interested in people. So yes, I’m drawn to books with complicated, even contrary, characters. Books that were touchstones for me while I was writing Everything I Never Told You were Arundhati Roy’s The God of Small Things, Toni Morrison’s The Bluest Eye, Ann Patchett’s Bel Canto, Elizabeth Strout’s Amy and Isabelle. In terms of general literary influence, I find myself more and more drawn to books by women about women: Elena Ferrante’s Neapolitan series, Anne Sexton’s poetry, Rebecca Solnit’s essays. “Women’s stories” are often dismissed as small-scale or domestic, and I’m interested in the ways those stories can actually be just as large as a war epic, and maybe even more important. SR: The novel covers themes that were particularly prominent in the 1970s: racism, sexism, and homophobia. What made you decide to touch on all of these issues (and their intersections)? Did it come naturally with the story, or did you set out with the intention to make a statement of some kind? CN: I never sit down to write a story About a Larger Issue—for me at least, that would be the surest way to write a story that failed. I always start with characters. The best analogy I have is that I sit down with each of them and listen to them talk, like you would with someone you met at a party. You ask them, where are you from? What do you do? What’s your family like? What TV shows do you watch, what kind of music do you listen to, what’s your favorite movie? What you’re really doing is getting to know who they are, what they like, and what bothers them, what’s on their minds. And from that you have a sense of what their story is. All of the themes of Everything I Never Told You—racism, sexism, all of that—came as I got a sense of who these characters were and what they were dealing with. With that said, all of these issues are very much on my mind all the time. I’m an Asian American, a woman, a person of color, a mother, a wife, a professional—racism, sexism, gender roles, all of that is part of my life. So it’s not an accident that I ended up writing a book that interrogated these issues, even though I didn’t have that in mind from the beginning. SR: One of my favorite parts of the novel is the way it shifts perspectives so often. I would be reading a section from Marilyn’s point of view and totally feel that her anger or frustration at James was justified, but then I’d read a section from James’s point of view and his actions made sense. What was it like writing from so many different perspectives? Was it difficult to keep track of voice or motivation for all of the characters? CN: The point of view (or points of view) was the hardest part of writing this novel. The book started out told in the close third person: first you’d have a section from James’s perspective, then one from Marilyn’s, then one from Lydia’s... But it got cumbersome and repetitive. To see both sides of an argument, the reader had to see it twice, once from one character and then from the other. So taking a step back, and having an omniscient narrator who could provide a more grounded, neutral perspective, helped sort all of that out, to remind both the reader and myself of what the characters were feeling at a given moment, or of what their motivations were. SR: You became a mother during the process of writing the novel. How do you think being a parent shaped your perspective in the later drafts of the book? What impact do you think it will have on your future works? CN: I’d thought, in early drafts, that I could accurately imagine my way into a parent’s perspective. After I became a parent, though, I think I felt more deeply how intense a parent’s love can be, and how easily good intentions can go awry when it comes to a child. Having a child made me remember again what it was like to be young, while at the same time seeing my own parents’ experience from a very different perspective. So I like to think that being a parent deepened my empathy all around, which hopefully will deepen everything I write. SR: You have a strong presence on Twitter, and a large following to interact with. How has this connection with the online community influenced your work? CN: I didn’t expect to like Twitter when I joined—but actually? I love it. Like many writers, I work at home, and spend a lot of the day alone, so Twitter is my equivalent of a shared office or a water cooler. I talk to people about common interests. I get a lot of my news there, both book-related news and political/world news. I catch up on pop culture there. And it’s a place where I can connect with both readers and with writers I admire—Twitter is strangely democratic in that way; anyone can talk to anyone. At its best, Twitter makes me feel less lonely, and it also reminds me, daily, of how smart and witty and kind people are. That’s not just good fodder for writing, it puts me in the right frame of mind to write. CN: It’s been in upheaval: for a while I haven’t had a proper writing space, because we were having work done on our house (it’s over a hundred years old and, suffice to say, it really needed it). So for the past year I’ve been working in coffee shops or in the Cambridge Public library, or in the middle of a construction zone with nail guns and rotary saws running. Now that the work is pretty much done, I’m trying to figure out what I want my new writing space to look like--I’m just settling into it. I like to keep it pretty simple, or I get distracted. So far I’ve got a desk in the corner next to the window, and along the wall in front of it, a restaurant-ticket-rail holding pictures and bits of inspiration and research—maps, etc. There will be a bookshelf, but right now I have a bunch of boxes holding all my books. There’s an abstract painting I made that’s an encoded quote from Annie Dillard’s The Writing Life. And there are lots of little things that make me smile: a one-inch picture frame, a picture of a pig my son drew for me, etc.